Preludio Mexicano "Cuiden su Vida"
Macchioni, a native of Argentina and, since 2003, a member of the faculty of the University of Texas at El Paso, the research Institute of which contributed to the production of this recording, has studied, performed and lectured internationally. 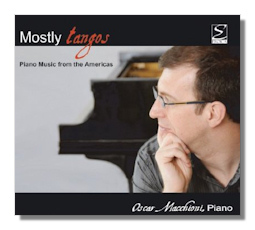 After earning three degrees in music from the Universidad Nacional de Tucumán, he studied piano in Kracow, LSU, and the University of Arizona in Tucson, where he received a doctorate in piano performance and ethnomusicology. Thus it should be quite unnecessary to say that he is a fine pianist, so I will just comment that his playing is strong, with clear and expressive phrasing. And the recorded sound is excellent. The Villa-Lôbos is a major work in four movements of eighteen minutes duration. The Preludio (Introdução) is gentle and the Bach element is the use of a circle of fifths. The Coral (Canto do Sertão) has a varied theme under a high B Flat, and ends interestingly with heavy chords and rippling notes. Aria (Cantiga) is based on a Brazilian folk tune and has a vigorously thythmic middle section. The final toccata (Dança - Miundinho) is fast and syncopated. I had not known that Barber had ever written a tango but it is a clear instance of that dance form and it is indeed quite danceable. Bolcolm's Dead Moth Tango is much less flowing and perhaps even expresses the rigor mortis of a moth which expired on his music paper. Ponce was a Mexican composer who studied in Berlin and Bologna early in the last century and was later advised by Dukas. His Preludio is an arrangement of a popular song. Intermezzo is both pleasant and celebrated. The last three pieces on the disc are from Argentina, where the national dance is the tango, a fact brought forcefully home to me a year ago when I was considering a trip to Buenos Aires and, after finding that its famous Teatro Colon was closed for a three year restoration (it reopened in May 2010), found that all the other musical venues appeared to feature the tango. The four-movement work by Castro (1895-1968) entitled Tangos is expressive (satirically I hope) of the behavior and outlook of four males one would not wish to identify with: a whiner, a criminal anti-hero, a more appealing party-animal gaucho, and an unsatisfied man recalling better times. Piazzolla (1921-1992) studied with Ginastera and Nadia Boulanger. His innovative musical idiom was resisted in Argentina because "in Argentina you can change anything but the tango." His Adiós Nonino (1955), the longest integral piece on this disc (nine minutes) was a tribute to his late father. Unpublished, and originally for quintet, some obscurities in the available score required interpretive decisions by Macchioni based on his knowledge of Piazzolla's work. The final piece here, Ginastera's Malambo, from 1949, is performed with an introductory prelude which Ginastera suppressed after the first edition but which the pianist feels "makes a beautiful contrast with the dance itself." The Malambo as a form is a type of acrobatic dance performed by gauchos of the Pampas – quite vigorously if this performance is anything to go by.